For me, today was one of the most exciting days in recent Cubs history since, well, when Theo Epstein was introduced as the Cubs president of baseball operations. 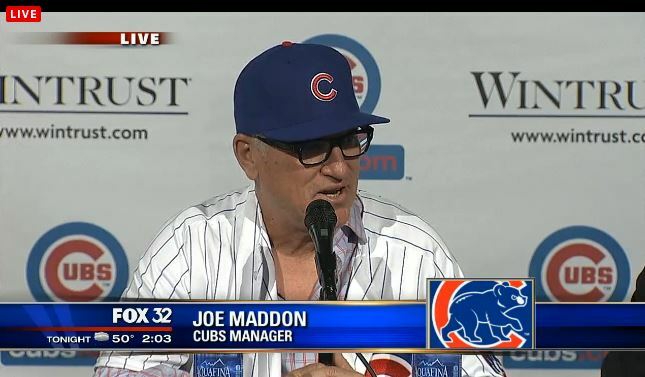 Today, Joe Maddon would have his introductory press conference as Cubs manager. he combines old-school scouting eyes with new-school number-crunching. he doesn’t like to wear out his players, particularly as the season grinds on (“being first at the park and last to leave doesn’t impress me”), a criticism of Dusty Baker during his tenure with the Cubs. Those are all philosophies that I myself uphold as a head coach at the youth baseball level. But as I listened to all these nuggets, my mind wandered a bit: where does Joe Maddon rank in the list of best MLB managers? After all, San Francisco’s Bruce Bochy just won his third World Series title in the last five years. Bochy is not big on sabermetrics (though he’s not anti-sabermetrics). But he holds unorthodox philosophies that I myself uphold, such as using your closer in a high-leverage situation—even if it’s in the seventh inning—rather than reserving the closer strictly for the ninth inning, and demoting someone who isn’t performing well even if he’s a highly-paid star (e.g., Tim Lincecum). Maddon apparently won’t do the former. Then there’s (hack! hack!) St. Louis’ Mike Matheny. He is what Fangraphs called “saber-friendly” (though he’s not completely pro-sabermetrics). On making decisions, Matheny said, “For me, first and foremost is gut instinct. Second is understanding the players. There are things that statistical analysis can’t help with, and the state of the individual players is going to rate really high with me. But is statistical data going to play into every decision? I would say yes. I want to make an educated decision with everything I do.” That sounds eerily like Maddon: the Blink-style gut instincts, resonating with players, understanding the state of the players, and sabermetric data all coming into play in his decision-making. What’s more, Matheny’s infamous youth baseball manifesto showed that he cared a lot about what was between their ears, that he doesn’t like to put pressure on his players, and that he institutes a respected culture of authority—more attributes that sound like Maddon. Matheny’s managing style is likely a big reason that the Cardinals still had success (two NLCS appearances and one World Series appearance) despite losing their Hall of Fame manager Tony LaRussa and famed pitching coach Dave Duncan. Other than Bochy and Matheny, it’s hard to say with certainty who the top managers are. Certainly Kansas City’s Ned Yost could be in the conversation but I’d personally like to see more than one year of success before anointing him as one of the best. The Yankees’ Joe Girardi could be a candidate but you have to wonder if your next-door neighbor could be a good Yankees manager given the roster of highly-paid superstars that the Yankees almost always collect. I was mildly excited when Dusty Baker and Lou Pinella came to the Cubs. But I’m really pumped about Maddon. Given Maddon’s success with the low-budget Rays in the ultracompetitive American League East division, it’s hard not to get excited about what Maddon can do with the Cubs. And if Maddon can indeed help lead the Cubs to a World Series championship, he would automatically shoot to the top of the list of best MLB managers because if you can do what no other manager in the last 106 years has done, you deserve it. 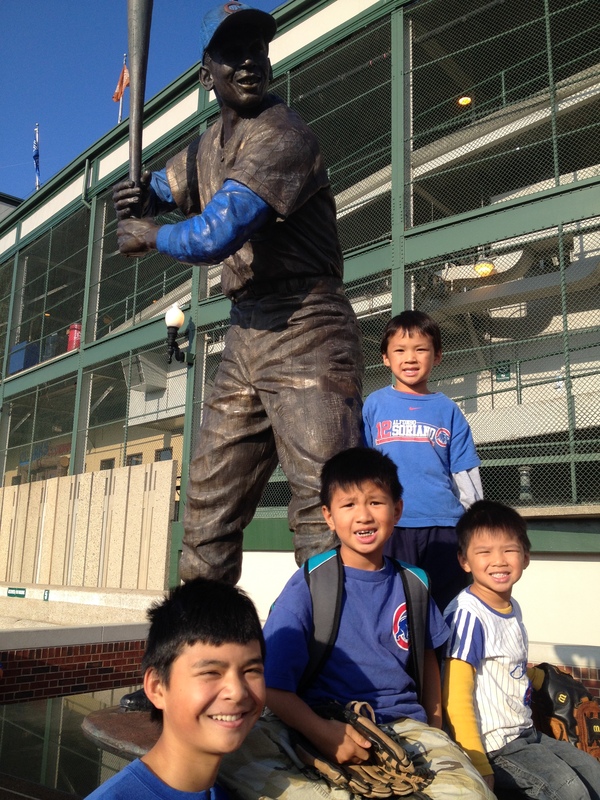 I took my four boys to Wrigley Field last night when the Cubs played the Dodgers. With a limited budget, I only take the boys to one game each year. We haven’t gone the last two years because the team was so bad then, but with top prospects like Jorge Soler, Javier Baez and Arismendy Alcantara, I thought it would be fun to see these exciting rookies…especially for the boys (ages 4, 6, 8 and 14). My boys are HUGE Cubs fans. They know the players just by their faces…even my little boys! It’s a “skill” I used to have as a young boy myself but I never mentioned that to them. I guess where you’re big fans, you’ll naturally be able to do that, but who knew these little kids were so perceptive about the players?! Anyway, my wife & I decided to take them early to the park to see the Cubs take batting practice. From some web sites, I found that the Cubs would take BP from 5:05pm (when the park opened) until 5:35pm, followed by the Dodgers from 5:35-6:20pm. So I left work early (after getting in early) and met the kids at Wrigley (my wife dropped them off) just before the park opened. We headed in and discovered there is a “Cubs Corral” where kids 13 and under can watch BP on the field instead of in the stands. You have to get a sticker at the Fan Services booth but they were out; the stickers act as admittance tickets. However, the helpful Fan Services attendant advised me to ask the Cubs Corral ushers if there might be extra stickers. We did, and there were. The kids entered the Cubs Corral but the Cubs finished BP shortly thereafter. I didn’t notice the time but it seemed really short…like around 5:20pm instead of 5:35. The Dodgers took the field. 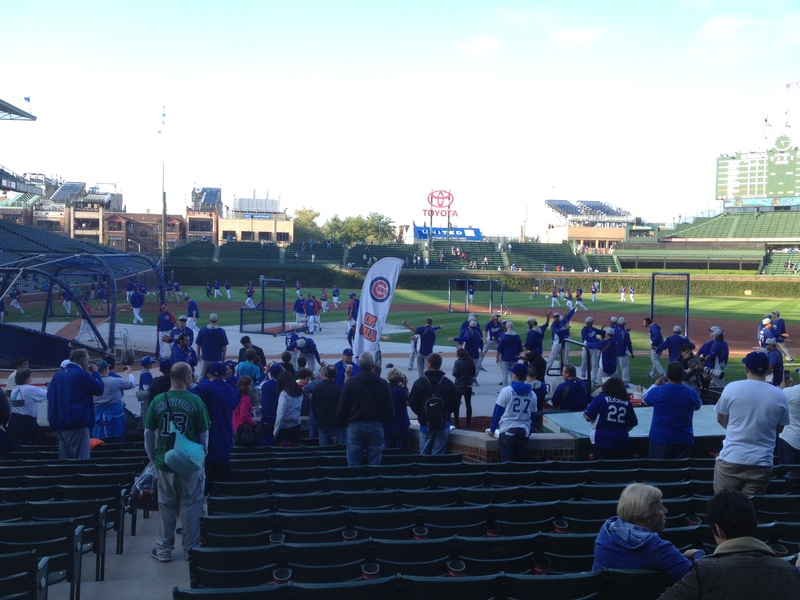 If you haven’t attended batting practice before at Wrigley, it’s quite a scene. I’ve taken the kids to Cubs games before but never early enough to watch BP, so they’ve never seen how major league players do batting practice. When I was a kid (in the 80s), I went to a few Cubs games early enough to watch batting practice and it was nothing like it is today. Back then, there was simply a BP pitcher, the cage, the batter, some other players hanging around the cage waiting their turn, and some other players in the outfield shagging balls. That was it. Today, there are multiple stations going on, with two infielding groups getting their infield work done while the batter is hitting, a coach hitting fly balls to an outfield group in right field, and another screen in center field to protect shaggers collecting balls into a bucket. A lot of activity, but even here, the shaggers aren’t doing much and are often talking to each other instead. 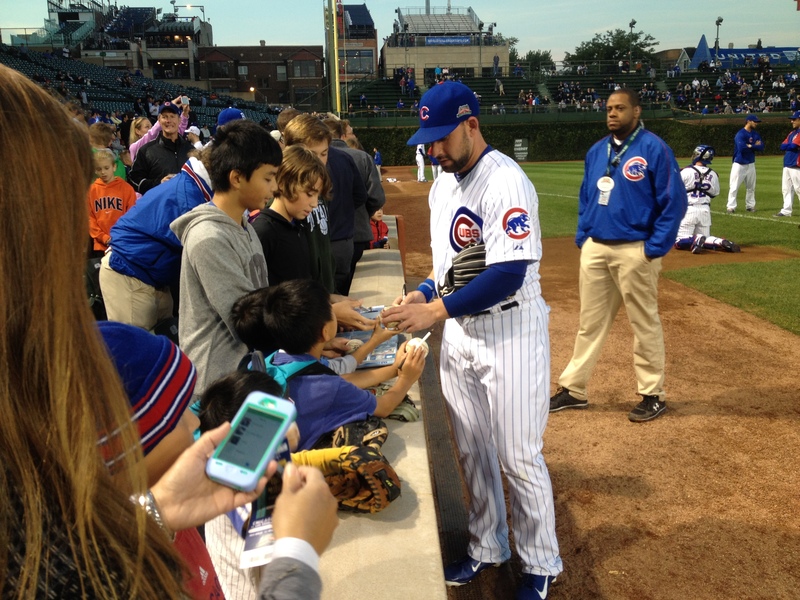 Well, the Cubs high-tailed it after their BP was done and didn’t sign any autographs for the kids at the Cubs Corral. Not surprising but a little disappointing. My boys hung out there and watched the Dodgers hit. The most impressive Dodgers display was by Matt Kemp, who hit four into the bleachers in one of his short stints in the cage. Some of the other kids in the Corral were calling for Kemp to sign. Initially, he didn’t want to, saying something to the effect of “Why should I sign autographs for you?” About 15 minutes later, he came over to sign, though my oldest son told me he looked rather reluctant. The kids also got autographs from some other Dodger stars, including Yasiel Puig and Adrian Gonzalez. My boys got bored watching the Dodgers and left the Corral. I asked an usher if we could go to the left field wall to get some Cubs autographs and he said, yes, if we went to Aisle 110 or beyond, we could try there. By the time we got to Aisle 110, the Dodgers were finally finishing up batting practice (it was indeed around 6:20pm). After waiting about 5 minutes, a few Cubs trickled into the dugout. The first out of the dugout was John Baker, who would be catching that night. He didn’t look in our direction, nor walked close by, so my kids didn’t even bother calling out to him. Tip: stand behind your kids, not with them so that players see the kids and not an adult. I’ve read that players are turned off by adults trampling over kids trying to get an autograph so I want to make it look clear that it’s my boys who want autographs and not me, which is true. 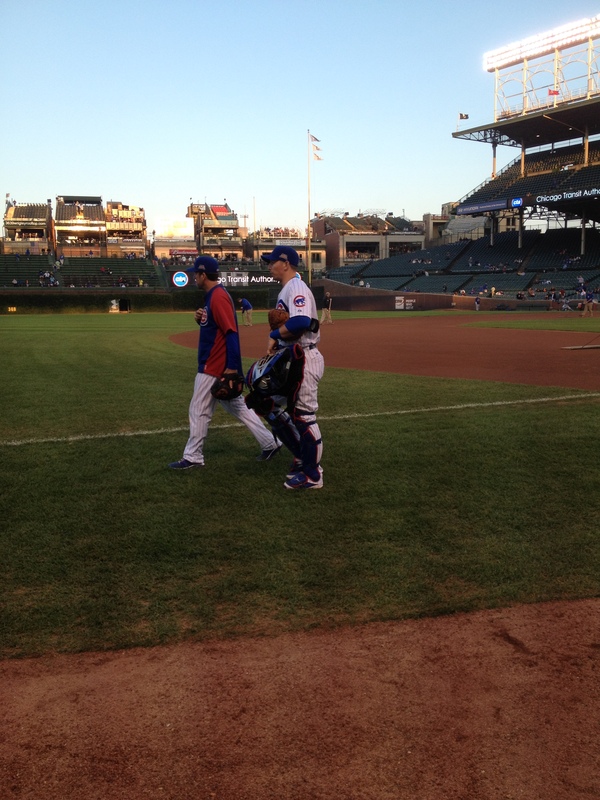 Next out was Tsuyoshi Wada, the Cubs’ starting pitcher that night. My kids started to call out to him at the same time a Japanese girl ran up to the wall and yelled something in Japanese to him. She took off her scarf and Wada looked back at her, not breaking his stride. He nodded at her, ignored us, and kept walking. The girl put her scarf back on and left, so I presume she wanted him to sign her scarf but obviously no success. About five minutes later, Chris Coghlan walks by with a bat. I don’t recognize him but my kids do. 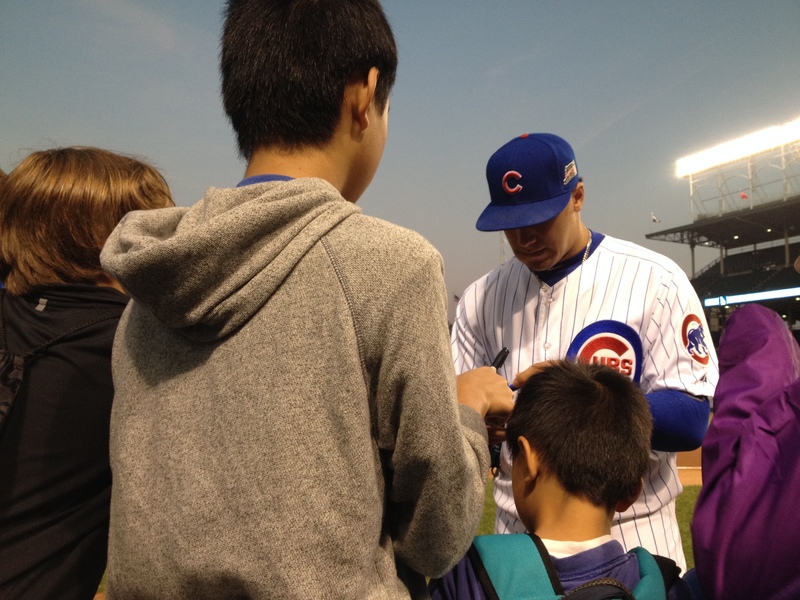 In fact, Coghlan is Henry and Ethan’s favorite Cubs player (at the moment), so they start calling out to him. He walks away, ignoring us as he heads towards the gate door under the bleachers in right field, which is where the indoor batting cage is. Well, this has been pretty disappointing so far. My oldest son asks if we should go to our seats. I’m always the optimistic type, so I say, “No, there’s nothing to do in our seats now anyway, so we might as well keep waiting here.” Besides, we’re the only ones here at the wall and it’s an amazing view—so close to the players!—, so why hurry to leave? Just a minute or two after that, Chris Valaika comes right up to us and asks if he can sign something for us. Our kids are excited and he signs my four kids’ items (three baseballs and a fielder’s glove). We thank him and he walks away. What a nice guy! Very cool dude. Much respect for making my kids’ night as our first signer when everyone else to that point blew us off. About another five minutes after that, Jorge Soler walks out onto the field. We’re all pretty excited but he’s not that close to us—standing around the foul line—and with his back to us. Soon, he faces us and my kids eagerly call out to him. He smiles and walks up to the boys—and signs their stuff! Wow…super cool! 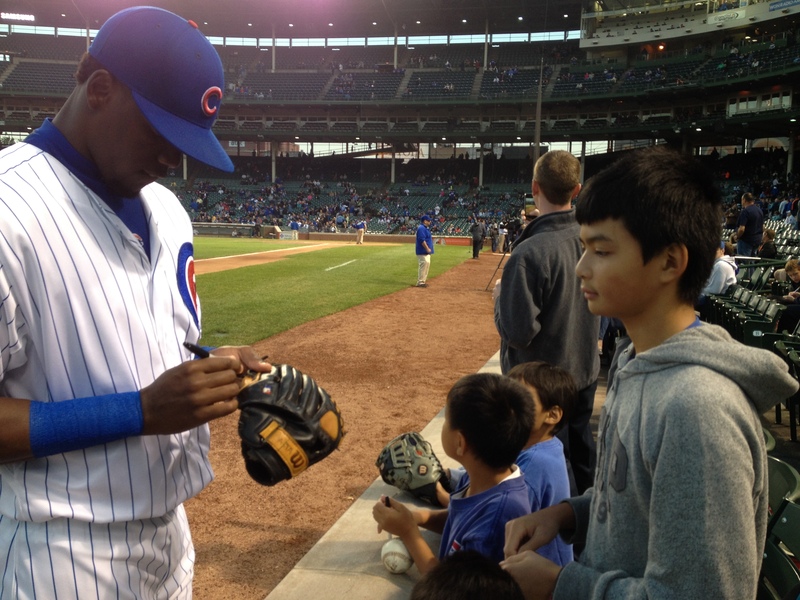 At this point, some other, older kids rush up for autographs but Soler leaves. Not sure if it was because the number of seekers was getting too big or what. Shortly after that, Ryan Kalish, who was called up in September ostensibly to take over injured Ryan Sweeney’s spot and would be starting in center field tonight, comes over and my boys ask him to sign their stuff. Again, other kids have come up and are asking for autographs as well. By now, the ticketholders of the seats by the wall arrive but they graciously let us stay there while they wait in nearby seats. 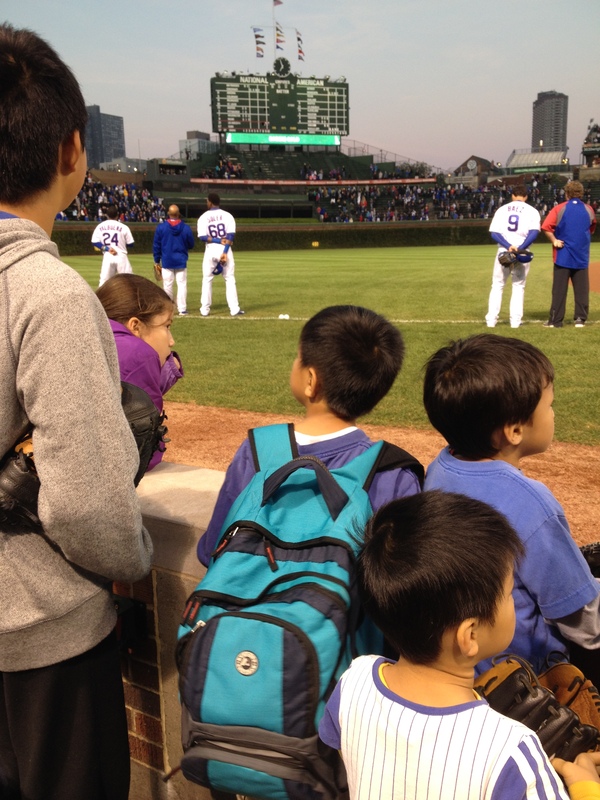 Chris Coghlan walks by again to stretch on the field, and again my boys are calling out to him. “Mr. Coghlan! Mr. Coghlan!” No response, so I yell out to him, “Chris, you’re my kids’ favorite Cubs player!”, which I mentioned before was true. Still nothing. Soon, Mike Olt comes by and my kids happily ask for his autograph. He signs for us too. He would be tonight’s starting first baseman. My kids talk about Olt a lot at home. Javier Baez comes out on the field and my kids are eagerly calling him. It’s honestly really cute to hear their little voices calling him. “Mr. Baez! Mr. Baez!” But he doesn’t respond. Now it’s the national anthem. My youngest son, who’s only four, doesn’t know any better so he continues to call Baez so I have to teach him that during the national anthem, we need to be quiet and listen. After the anthem, my kids keep calling for Baez—and he comes over to sign! And he signs for my boys first. How cool is that? We thanked the seat ticketholders for letting us hang around in their seats to get autographs and headed to our own seats. When we all got to our seats, I asked my oldest son if his view of Coghlan was lower since he wouldn’t sign an autograph. To his credit, my son said no. I too don’t have a lower view of Coghlan (or Wada or Baker for that matter), though I must admit I have a much higher view of Valaika, Soler, Kalish, Olt and Baez. The Cubs ended up losing the game (some questionable managerial decisions by Rick Renteria, but that’s for another post) but the boys went home on a really high note b/c they got those autographs—so happy you would think the team won. In the end, we got five Cubs’ autographs, including Soler and Baez! Anthony Rizzo and Starlin Castro are out, as well as Alcantara, but I’d call tonight a smashing success for autographs. We even got Kemp, Puig and Gonzalez as a bonus. I really think we got those autographs b/c those squeaky kids’ voices calling for the players is so cute and irresistible 🙂 And also, I think we got those autographs b/c of persistence. Being patient and waiting, even when it seemed hopeless. Isn’t that a metaphor for life? In general, I think Cubs players, especially the stars, are great to the fans and don’t act stuck up. A few years ago, my oldest son and I waited in the parking lot after the game and Matt Garza (then the ace of the pitching staff) came over to sign autographs. Not sure if Theo Epstein encourages the players to do it as part of “The Cubs Way”, but that fan-friendly quality helps endear the players (and the team) to the fans. And it made my boys’ night. Dan Wetzel of Yahoo Sports said Dungy’s assessment of openly gay NFL rookie Michael Sam as a “stunning lack of courage” and a “complete cop-out”. The Chicago Tribune columnist Steve Rosenbloom said (registration required to read the article in the link) Dungy’s comments were “lame and cowardly”. Gee, what a surprise: both columnists hold liberal views so they embrace the gay man Sam while ripping on the Christian man Dungy. I haven’t read every critical opinion on Dungy’s comments, but it’s almost guaranteed that all of those anti-Dungy opinions are by people who support gay rights. I don’t normally respond to every opinion piece that defends gay rights, gay marriage or gay people because the liberal media is so voluminous in their defense of gay whatever that there wouldn’t be enough time in the day to do so. But this issue warrants a quick injection of minor insights. First, rather than lacking courage, considering that polls now say the majority of Americans support gay marriage, the fact that Dungy made an anti-Sam comment by definition took quite a bit of courage since he is voicing an opinion that is supposedly in the minority now. Second, being a former NFL head coach, Tony Dungy would know significantly more than Wetzel, Rosenbloom and the myriad other loudmouths who can only dream of what it’s like in an NFL locker room and what chemistry is like on an NFL team. So if someone is giving an opinion on whether things will go smooth, um, I think it’s safe to say that Dungy’s opinion has more weight. Some commentators have said that Sam’s teammates have said they don’t have a problem with Sam. Well, duh! What do you expect them to say? “Man, I don’t want gay people in the locker room with me!” Sheesh, they’ll be ostracized as fast as these same media types are ostracizing Dungy. These players aren’t stupid. Unlike the commentators. Third, the arguments being made to criticize Dungy are so moronic, it’s amazing those columns made it past their respective editors. Unless the editors too are liberals. Oh, never mind. For example, both Wetzel and Rosenbloom bring up Dungy’s supposedly hypocritical acceptance of Michael Vick and rejection of Sam. The thing that these writers keep forgetting is that Vick apologized for his sins and was making good-faith efforts to distance himself from his sins while Sam is, uh, openly gay. As in, not apologizing nor distancing himself from his sins but instead proudly proclaiming his sins. Far from being hypocritical, that’s Dungy being entirely consistent with his biblical worldview. Welcome to Dan Wetzel, Steve Rosenbloom and like-minded liberal writers’ world. Those are some writing heads Yahoo and the Chicago Tribune have, huh? Their logic is impeccable, huh? As another example, both Wetzel and Rosenbloom made the same argument that Dungy benefited from people in the past who gave black people a chance to play or coach sports. It’s amazing that liberals still use the nonsensical “black rights is the same as gay rights” argument. However, gay people cannot procreate and give birth to more gay people. Biologically, a man + a man cannot give birth to a baby. Ever. And a woman + a woman cannot give birth to a baby. Ever. So gay rights can NEVER be equated to black rights. Ever. It’s just that simple. In fact, many black people will get offended if you try to equate gay rights the same as black rights. Hey, if a “sexual orientation” is enough to demand equal rights, what about people with other types of “orientations”? What if a proud, self-proclaimed pyromaniac wanted to work in a library? 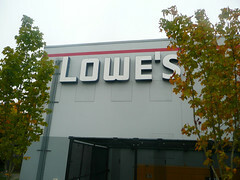 Or a proud, self-proclaimed kleptomaniac wanted to work at a store? Do they get equal rights too? Everyone needs to just calm down. Dungy said things will not be totally smooth and that things will happen; ironically, the reaction to his comments proved him right. Spurs’ 2014 NBA Finals win proves LeBron James is no Michael Jordan, more goat than G.O.A.T. When he signed with the Miami Heat, LeBron James promised he would make history. And he did. After the San Antonio Spurs routed LeBron’s Heat with a 4-1 series win in which the Spurs’ margin of victory in their four wins were 15, 19, 21 and 17 points, LeBron James’ Heat helped the Spurs reach 12 total games in the postseason by 15 or more points—an NBA record. Other LeBron promises? Not so accurate. During their introduction party in 2010, in which LeBron, Dwyane Wade and Chris Bosh were brought out amid plumes of smoke for their adoring fans and lifted into the air via forklift, LeBron said he would win at least 8 championships with the Heat. How easy? So easy, LeBron said a 65-year-old (at the time) man could play with them and they’d still win championships. The Heat thought they could just buy themselves 8 championships in paying $327.7 million to James, Wade and Bosh. But then the Dallas Mavericks ruined LeBron’s prediction in his very first year of seeking “easy” championships. And the Spurs should have beaten the Heat last year, being just a Kawhi Leonard missed free throw away from winning the championship. And of course, you know what happened this year. Any talk of LeBron being the Greatest Of All Time (or G.O.A.T.) looks as ridiculous now as casting Bill Murray to play Rambo. LeBron is now 2-for-5 in the NBA Finals in his career. For those who are in remedial math, it means he has a LOSING record in trying for championships. Michael Jordan was 6-for-6. For those in remedial math, that means Jordan NEVER lost an opportunity to win a championship. Not once. LeBron is 0-for-1 in three-peat attempts. Jordan was 2-for-2. LeBron couldn’t win in Cleveland so he had to find a different team who could buy him some superstars to help him win two championships. And even WITH his superstar free agent buddies, LeBron still lost twice in the NBA Finals. That means LeBron has LOST as many championships with the Almighty Heat as he has won (2-2). Heck, the vaunted Heat haven’t even won 70 games in a regular season, unlike Jordan’s Bulls. Wait, I thought “once the games start, it’s gonna be easy.” LeBron made it sound like the Heat should be regularly finishing the regular season 82-0. LeBron the Greatest Of All Time? Seriously? What an insult to Michael Jordan and the Bulls. Last night’s championship-clinching Game Five shatters Vogel’s bone-headed claims to a million pieces. In that game, LeBron had 31 points and 10 rebounds. But it was arguably the quietest 31 points in recent NBA Finals history. While James had 17 Jordanesque first-quarter points, James did an un-Jordanesque disappearance the rest of the game, allowing the Spurs to roll all over his team for a third consecutive game—also something Jordan never allowed to happen. After the Spurs kicked the Heat up and down the court to clinch the 2014 NBA championship, some commentators said the Heat needs to get a better supporting cast for LeBron. A better supporting cast? LeBron said the Heat could win “not one, not two, not three, not four, not five, not six, not seven” but eight or more championships with a 65-year-old man as the supporting cast. And that he “really believes it.” But now the Big Three need a better supporting cast? Excuse me while I muffle my laughing. The Heat paid $327 million to three superstars (that’s more than the economy of many entire countries)—and they still need a better supporting cast? How do these commentators keep their jobs? I bet those commentators did not even realize what a slamming indictment that is on LeBron James, Dwyane Wade and Chris Bosh. Why would the alleged Greatest Of All Time plus two other superstars STILL need a better supporting cast to win championships? Since Pat Riley is not playing, their supporting cast is already better than what James said he needed to win 8 championships. And BTW, what kind of supporting cast did Michael Jordan have during MJ’s six championship years? During the Jordan, Scottie Pippen and Horace Grant years (and keep in mind that Grant was only an All-Star once; Bosh is a nine-time All-Star), the Bulls’ Top Three played with the likes of B.J. Armstrong, Scott Williams, Cliff Levingston, Will Perdue and Craig Hodges. Only die-hard Bulls fans would remember those names—and those were the most “famous” of the supporting cast. Rory Sparrow, Bobby Hansen, Dennis Hopson, Chuck Nevitt, Ricky Blanton, Jo Jo English, Joe Courtney, Ed Nealy, Mark Randall and Darrell Walker were also part of the supporting cast. Any of those ring a bell, much less strike fear in an opponent? During the Jordan, Pippen and Dennis Rodman years (and keep in mind Rodman was only a two-time All-Star compared to Bosh’s nine All-Star appearances, and Rodman didn’t have anywhere near the offensive talent of Bosh), the supporting cast consisted of Randy Brown, Jason Caffey, Jud Buechler, Jack Haley, John Salley, Dickey Simpkins and Bill Wennington. Any of those names sound like a strong supporting cast? In fact, the best bench player the Bulls had then was Toni Kukoc—and Jordan didn’t think Kukoc was much help either. Put it this way: if LeBron, Wade and Bosh played with Jordan’s supporting cast, the Heat probably would be lucky to win 50 games. Now LeBron, D.Wade and Bosh need a better supporting cast to win championships? If that’s true, then LeBron, D.Wade and Bosh better refund Heat owner Micky Arison all those millions they were paid to “easily” win championships. Rumors have it that the Heat want to buy themselves a fourth superstar free agent in Carmelo Anthony. I say, go for it. It’s clear that LeBron is definitely NOT the G.O.A.T. but actually needs all the superstar help he can get. So go for it, Pat Riley…buy yourself a fourth superstar free agent. Demand the salary cap get pushed up so you can keep buying more superstars (is Kevin Durant available?) and sellout All-Star free agents like former Celtic Ray Allen. Buy a fifth superstar and a sixth superstar while you’re at it. Maybe LeBron needs a complete roster of free agent superstars to win those eight championships. 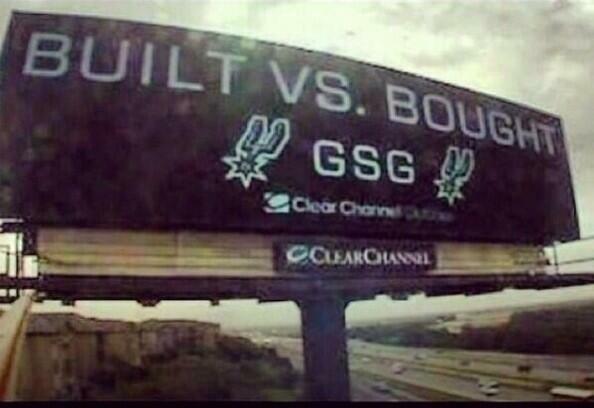 After all, championships are bought, not built, right? Even if LeBron won eight championships with the Heat, he still wouldn’t be the G.O.A.T. because he needed to team up with other superstars to do it. As Charles Barkley put it, LeBron taking his talents to South Beach automatically took him out of that conversation of being the G.O.A.T. And LeBron failing to win championships even WITH the other superstars solidifies LeBron as the goat, not the G.O.A.T. The morning after the Bears were eliminated from the 2012 NFL Playoffs, head coach Lovie Smith was fired. Thus started one of the best days of 2012. Many so-called Bears fans mourned Lovie’s firing. And plenty of variations of the same ideas. Lovie Smith is a big Barack Obama fan. And I automatically lose all respect for Lovie right there. But leaving politics aside, the Bears absolutely made the right move to fire Lovie Smith. In fact, it could be argued the firing came two years too late. – failed to make the playoffs in five of the past six seasons. That’s a 0.167 rate for making the playoffs the past six years. – he lost 8 of his last 9 games against the Packers. Beating the Packers was Lovie’s self-proclaimed #1 goal. – the Bears finished 28th in offense this year. Can’t blame Mike Martz this year, pal. – the Bears finished 28th in offense this year despite a franchise quarterback, a Pro Bowl receiver and a Pro Bowl running back. – the Bears offense has finished higher than 23rd just once in Lovie’s nine-year tenure with the Bears. – For those who argue it’s not Lovie’s fault the team has a bad offensive line, recall that Lovie said: “We feel like our offensive line is as good as any other out there.” Clearly Lovie has no idea how to evaluate offensive line talent. – Lovie is a poor evaluator of coaching talent. He fired accomplished defensive coordinator Ron Rivera to hire his good ol’ boy buddy Bob Babich, whose ineptitude made him last only two years before being fired. – Lovie couldn’t even get in the playoffs last yearn despite what could be a league-record three former head coaches on his coaching staff (Mike Martz, Mike Tice and Rod Marinelli). – Lovie is one of the worst fourth-down coaches in the league (26th in 2012, 31st in 2011, 31st in 2010, 26th in 2009, 26th in 2008) as well as possessing one of the worst replay-challenge records in the league. – For all of the praise about Lovie as a “great man”, other coaches repeatedly turned down offers to join his staff. Mike Martz was one of the last on Lovie’s list for offensive coordinators, and current Giants defensive coordinator Perry Fewell famously refused to even interview for the job that went to another Lovie buddy in Rod Marinelli. – The Bears failed to make the playoffs this year despite a 7-1 start. No Jay Cutler season-ending injuries to blame this year. No Matt Forte season-ending injuries to blame this year. – The Bears’ 10-6 record this year is a mirage. Lovie’s Bears were 2-6 against teams with winning records this year. The Bears had the fortune to play eight games against bad teams with a combined record of 43-84-1 (a stunningly bad 0.341 winning percentage). The bottom line is that if you consistently do not get your team in the playoffs, you should not be coaching. It’s as simple as that. Sure, Lovie Smith will find employment elsewhere in the NFL. My condolences to whoever that poor team is that hires him. Most people, particularly in the media, love Starlin Castro. While some even dubiously proclaim Castro as the next Ernie Banks, count me as someone who’s not quite as impressed with Castro. While Castro accomplished an impressive feat in ringing up 207 hits in 2011, he needed 674 at-bats (the second-highest in the majors) to do so. In addition, Castro has nowhere near Banks’ power: Castro hit 13 home runs in his first 1137 at-bats while Banks hit 21 home runs in 509 fewer at-bats than Castro. Could Castro develop power later in his career, as some hope? Possibly, though history shows power doesn’t usually develop later unless steroids is involved. The lack of power isn’t a real concern. But Castro’s iron glove and wild arm is. The 21-year-old Dominican led the majors in 2011 with an amazing 29 errors, proving that his 27 errors in 2010 (second-worst in MLB) was no fluke. FanGraphs posted Castro’s UZR (an advanced fielding metric that estimates a fielder’s defensive contribution compared to a league-average fielder) as -8.7, second-worst in the majors among regular shortstops. His defensive liabilities offset some of his offensive contributions. Merely accepting Castro’s defensive limitations should not be an option. The question is: what can the Cubs do then? What to do with Castro? Some have bandied the idea of trading Castro. It’s not a bad idea. If everyone else is enamored with Castro, why not trade him while his value is sky high and get a bunch of top prospects? After all, the Cubs need help at a lot of positions and you could fill several of those voids with one trade. As the Chicago Tribune reminded, the Rays got several exciting prospects and a major-league defensive contributor when they sent Matt Garza to the Cubs, and the Royals got several top prospects and a major-league defensive contributor when they traded Zach Greinke. Just don’t trade Castro for a couple middle-tier prospects. If Theo Epstein is like Tampa Bay’s shrewd GM Andrew Friedman, then he’ll require multiple highly significant prospects for Castro. But Castro staying with the Cubs is probably the most likely scenario. Epstein has compared Castro’s defensive issues with an early Derek Jeter, implying that Castro too can eventually win five Gold Gloves as Jeter has. Epstein’s comments are puzzling since he, a sabermetrician, should know that sabermetrics clearly reveals Jeter to have performed well below average for nearly his entire career in baseball (or as one blogger succinctly wrote, “Derek Jeter is a crappy fielder“). Just this past summer, Jeter was dead-last in DRS (Defensive Runs Saved, a metric used to evaluate how many runs a player saved or hurt his team compared to an average player at the position) among regular shortstops (-18), worse than even Castro (-16). In 2010, the last year Jeter won a Gold Glove, he had the fourth-worst shortstop DRS at -13. While Jeter has earned his Gold Gloves for his reputation on some flashy plays, Baseball Prospectus’ James Click cautioned in an article entitled “Did Derek Jeter Deserve The Gold Glove” (the answer is no), “While spectacular effort is a joy to watch, it should not be confused with results.” As performance analysts know, Jeter isn’t even the best SS on his own team (that would be Alex Rodriguez). The Cubs could keep Castro at SS, but why put up with the defensive struggles when you can minimize it? This was an argument Click made about Jeter, stating that the Yankees should have moved Jeter to CF and put Rodriguez back at SS. While some suggest moving Castro to 3B, I suggest the Cubs remove him out of the infield completely and put him in the outfield. On occasion, Castro shows a flair for the spectacular play but far too often fails to make the routine play. In general, moving a shortstop to 3B will slightly improve that player’s defensive contribution by 1.9 runs per year. However, it’s uncertain if a fielder as bad as Castro will see that slight improvement. Since Castro bungles grounders and slings wild throws from the shortstop position, it’s quite possible he will also bungle grounders and sling wild throws from the third base position. In fact, it could potentially be even uglier at third base when Castro also must charge bunts/slow rollers and then hurry a throw to 1B. Moving Castro to the OF instead of 3B would limit damage because not all errors are equal. Outfield errors are rarely on dropping catchable fly balls but instead due to bad throws and bad fielding. Thus, outfield errors almost never turn sure outs into baserunners; rather, the baserunners already exist but they get an extra base or two on a bad throw or poor fielding of a grounder. On the other hand, shortstop errors always turn routine outs into baserunners. Since baseball’s two most precious commodities are runs and outs, shortstop errors negatively affect both. Not only does the defense not reduce one of the offense’s 27 precious outs, but the offense now also has a runner on base that should not have been there, which in turn creates a higher likelihood for the offense to score runs (run expectancy is always higher with a man on base than with bases empty). 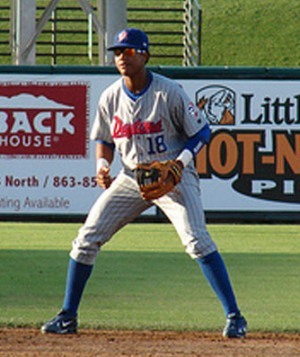 Indeed, Castro’s DRS for 2011 was -16, again second-worst among all regular shortstops and far below the average shortstop, the Angels’ Erick Aybar. Baseball Prospectus has shown that moving a SS to LF improves the team’s defense by an average 4.8 runs per year. With Castro, this number would be higher. So why not put Castro in CF, where his strong arm could be an asset? The main reason is that Tony Campana is a known commodity at CF as a strong defender with great speed and great range, two important qualities for CF. Replacing Soriano, with his marginal arm, with Castro in LF would be a better option defensively. Check out all those negative DRS figures. No wonder the 2011 Cubs defense was so awful. The Cubs could then put Marlon Byrd (who was -2/+2.2 in CF in 2011) at 1B, resolving the issue of finding a first baseman. This suggestion would significantly upgrade its defense not only at SS but in many other positions on the field. In addition, learning a new position would be kept to a minimum (a minor adjustment for Barney; while Castro would be learning an entirely different position, it’s an easier position to learn, as would be the case for Byrd learning 1B). And what’s more, this suggestion would substantially upgrade the entire defense without having to trade away any prospects or spend one cent on a free agent. Glaringly, the biggest problem with this suggested defense is that it puts Alfonso Soriano and his offensive production on the bench. But this would only be one problem for Epstein to resolve, compared to trying to resolve multiple glaring problems, any one of which could spell doom for the Cubs in a close game (the team was 25-28 in one-run games in 2011) or turn a close game into an uncontested loss. Moving Castro to the OF may seem radical but when the status quo clearly isn’t working, why not put all options on the table? If the Cubs want to seriously compete for a championship, it cannot afford 25-30 errors at the most important position on the field. What do you think? Do you like the idea of moving Castro to the OF? Or do you think Castro should stay at SS and can someday improve from “near league worst” to “average”?